That is one fine useful gadget! Good score. Well done! I actually scared my family with my ecstatic screaming when I discovered that the previous owner of my house left his indoor/outdoor thermometer for me. :) Yes, that was definitely a post-worthy find. 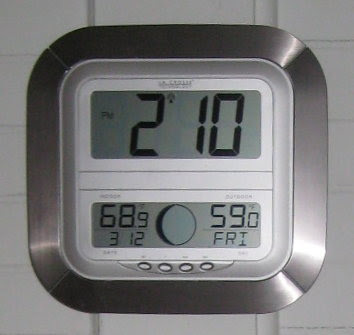 we love our indoor/outdoor thermometers! We have one with a clock too, but it isn't atomic. now to just go change the batteries in the outdoor transmitter! when I gave my husband something like this, he laughed at me! I thought he can finally tell people on his radio (he is a radio amateur) the temperatures the way they always do... after a year or so he realized that he uses it all the time, everyday - now who's laughing:)) but I find it useful for the garden as well! the only downside of it - when the batteries run low, it starts beeping rather annoyingly - even in the middle of the night:)) my favourite gadget? apart from the textile bits? hm, I guess it's my very ancient (25 years old - or more) bosch "kitchen machine" (=food processor plus mixer etc.). I use it all the time and will try to get the same one again, when my old trusted machine gives up! most definitely the best investment I've made! Isn't it funny how the little things in life can make us so happy? Yes! I would love to have one of those gadgets. Awesome!!! We got ours as a wedding gift and it doesn't read the outdoor temperature... so I guess it doesn't work. Although my husband is the one that set it up... I guess I should take a look at it! :) Have fun with yours! I am in love!!! Where did you find it? We actually have two - one in the bedroom that gives current conditions and one in the living room that gives the forecast. I love 'em too. Renee, batteries! The only down side. I keep telling myself that I'm not going to buy any more battery operated gadgets, but I couldn't help myself when I saw this one! Bettina, how funny. These are really useful in more ways than we first think. And once one gets used to something like that, it becomes quickly indispensable! Barb, that is so true. I reckon that's what meant by "simple pleasures." Callie, be on the lookout! It is great to have. WFR, that's a disappointment. I hope it's something you can figure out without having to replace it. Benita, I found this one at WalMart. It was on a clearance shelf marked $7. I didn't think twice about snatching it up! Sharon, you have one that gives the forecast! I'm jealous! I will have to be on the lookout for one myself. I was afraid that I was only one living in a household with multiple indoor/outdoor thermometers. Jim somehow got the one that shows the forecast for free. There was a giant rebate or something. My latest favorite gadget is the dog door we just put in for Bailey so he doesn't scratch at the door and totally annoy us all day! Want to thank you for the responce to my comment from before. I have been writting a Blog for a few months and don't have that meny followers as yet. So Thanks again! To answer your question on gagets: 1). I s an old hand crank slicer and grader that I found at a swap meet in Iowa years ago. My Mom had one when I was a kid and it was my job to shread potatoes with it when they were on the menue. And 2.) The Food saver I got awhile back. I hate freezer burn and plastic bags or foil just didn't do the job for me. The food saver bags are reusable and Vacume sealing is the only way to go. Vegatable, Meats ect, you name it! Soft foods must be frozen on a cookie sheet first, then vacume sealed. Simple! Tom I didn't realize the food saver bags were reusable. That's the only thing that really kept me from considering one! Thanks for that.